Animation fans rejoice, as the final installment of Avatar: The Last Airbender has finally arrived! But it's also a bittersweet moment, as we can no longer look forward to experiencing any new adventures with these characters. Oh sure, there is a planned trilogy of live-action feature films, but they're being written, produced, AND directed by that ultimate master of boredom, M. Night Shyamalan. What a disappointment that was to hear. Anyway, I don't even want to think about that right now, as I'm hear to tell you all about Avatar: The Last Airbender - Book 3: Fire, Volume 4 . This disc contains the final six episodes of the Avatar saga, and each one is as good as we've come to expect from this amazing series. We start with Chapter 16, The Southern Raiders, where Katara is still having a hard time accepting Prince Zuko into their group. Zuko eventually learns the reason behind this... when she was young, the Fire Nation raided her village and killed her mother. Knowing this, Zuko comes to her and tells her that he could help find her mother's killer. With hate in her heart, and despite Avatar Aang's plea for her to forgive the guy, Katara and Zuko take off in search the murderous commander of the fleet which attacked her village oh so long ago. Chapter 17, The Ember Island Players, is a nice episode which changes the pace a bit, giving the group a chance to relax. Team Avatar, having decided to take refuge in Prince Zuko's family island resort while Aang trains in his firebending, learn of a local play about the adventures of Avatar Aang. So of course they have to go check it out! What they see is an interesting look at their adventures so far, much of it surprisingly accurate. But seeing exaggerated forms of themselves up on stage tends to put a lot of our heroes in a grumpy mood, and this is made worse when the timelime catches up with the present, but the play continues on to show their defeat by the fire lord. Chapter 18: Sozin's Comet, Part 1: The Phoenix King is the begging of the end, the first in the final four episodes which could all fit together nicely for a feature length film. As Aang continues to prepare for his battle with Fire Lord Ozai, we learn that he has decided to wait until after Sozin's Comet passes before taking on Fire Lord Ozai. But Zuko reveals that Ozai is going to use the Comet's effect of stengthening firebenders to completely wipe out the entire Earth Kingdom... so if Aang doesn't defeat him before that, there won't be any world to save. Meanwhile, we find that Ozai is actually giving up his title of Fire Lord to his daughter, Azula. Why? Because he's crowning himself The Phoenix King, supreme ruler of the world. Talk about an ego! In Chapter 18: Sozin's Comet, Part 2: The Old Masters, Aang finds himself in a moral dilemma, as he doesn't feel that he should kill Fire Lord Ozai, but knows if has no choice but to stop the evil one. Unable to come up with an alternative to killing, Aang goes on a spiritual quest to help him find some answers, though even when he asks his past lives, he doesn't like the answers they give. Meanwhile, Sokka and the rest of the group go off in search of Aang, who had just seemed to mysteriously disappear during the night. It is during this quest that they encounter a group called The Order of the White Lotus which is made up of bending masters from Fire, Earth, and Water nations. And so the war is on in Chapter 19: Sozin's Comet, Part 3: Into the Inferno. Prince Zuko and Katara show up at Azula's coronation ceremony and attempt to stop her once and for all, while Aang finally faces off against Ozai, now known as the Phoenix King. While this confrontations are taking place, Sokka, Toph, and Suki attempt to disable the fleet of Fire Nation airships and The Order of the White Lotus launches a full scale assault to reclaim the city of Ba Sing Se. Talk about intense! This has got to be the most action-packed episode of Avatar: The Last Airbender! 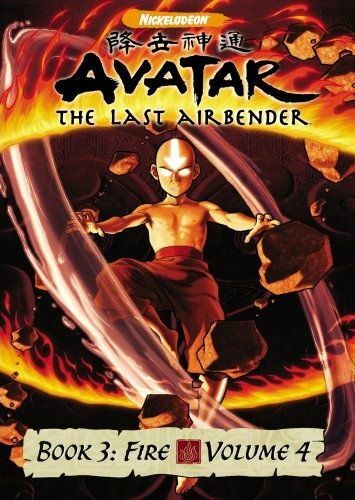 Finally we come to Chapter 20: Sozin's Comet, Part 4: Avatar Aang. But I don't want to spoil the ending, so I'm just going to stop now. Needless to say, it's every bit as awesome as one would expect from this series. By this point you are so emotionally invested that there's no way you could turn this off before watching it to the very end. Makes me wish that they would continue with another season. The special features on the disc may consist only of audio commentaries by creators, cast, and crew, but I'm still going to be listening to those, as watching these episodes over again is definitely not a problem! It's sad to see this series come to an end, but it was a fantastic ride while it lasted.